There are some places that you visit in Canada that will stick in your mind forever. 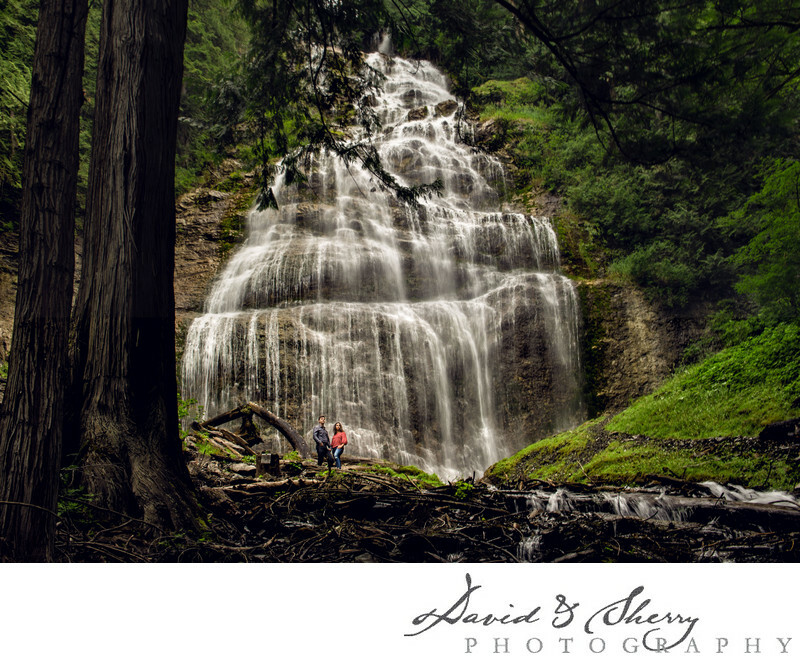 I had the privilege of shooting this newly engaged couple at the magnificent Bridal Falls in British Columbia. This stunning location is nestled in the community of Fraser Valley, which I believe to be one of the most scenic towns in BC. The sight of this cascading waterfall will leave you awestruck with white water trickling down the wall of rocks, surrounded by tall trees and greenery. On a warm August day, I was able to capture this wide view photo with the couple standing at the foot of the waterfall, as well a variety of other shots featuring this outstanding landscape. The lush forests and greenery in the area were also very picturesque, featuring many green mossy rock faces and fern-covered grounds. This enthusiastic bride-and-groom-to-be were happy to venture to the bottom of the extravagant waterfall, and although the mist dampened their clothes, their willingness and excitement made for some awesome couplescape shots. Engagement shoots are always a great time to get to know the couple, as well as a time to be adventurous and capture fun and unique photos that suite the couple's personalities.